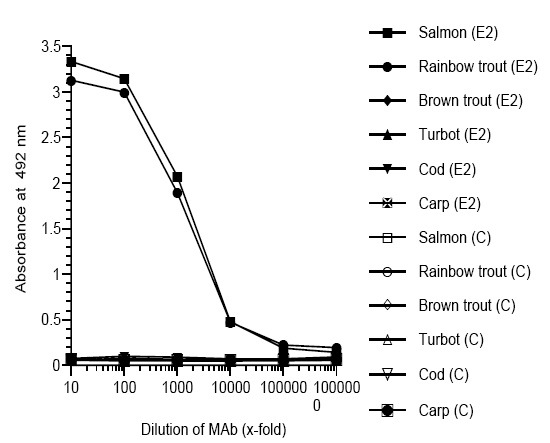 This antibody binds with high affinity to zona radiata proteins (Zrp) in plasma samples from Atlantic salmon (Salmo salar), reacting primarily with the g monomer. Purified eggshell proteins (zona radiata proteins and small amounts of zona pellucida proteins) from Atlantic salmon (Salmo salar). Plasma from 17ß-estradiol treated Salmon. Our Abpromise guarantee covers the use of ab36802 in the following tested applications. WB: 1/100 - 1/1000. Detects a band of approximately 45 kDa. The antibody is dissolved in a buffer containing BSA, and is therefore not recommended to use for coating. Zona radiata is a thickened, rather complex egg membrane of teleost fishes, which often has a radiate appearance. It is formed at the surface of the egg by the ooplasm, or the ooplasm and the follicle cells and hence should be regarded as a true vitelline membrane. May be overlain by the chorion, the zona radiata underlies or overlies a homogeneous vitelline egg membrane. Coating: Plasma (diluted 1:1000) from 17ß-estradiol treated (E2) or control (C) fish. Lane 2 : Purified Zrp, [alpha, beta and gamma]. ab36802 has not yet been referenced specifically in any publications. Publishing research using ab36802? Please let us know so that we can cite the reference in this datasheet. There are currently no Customer reviews or Questions for ab36802.